I will be hosting a livestream this weekend for my LN2 benching sessions. 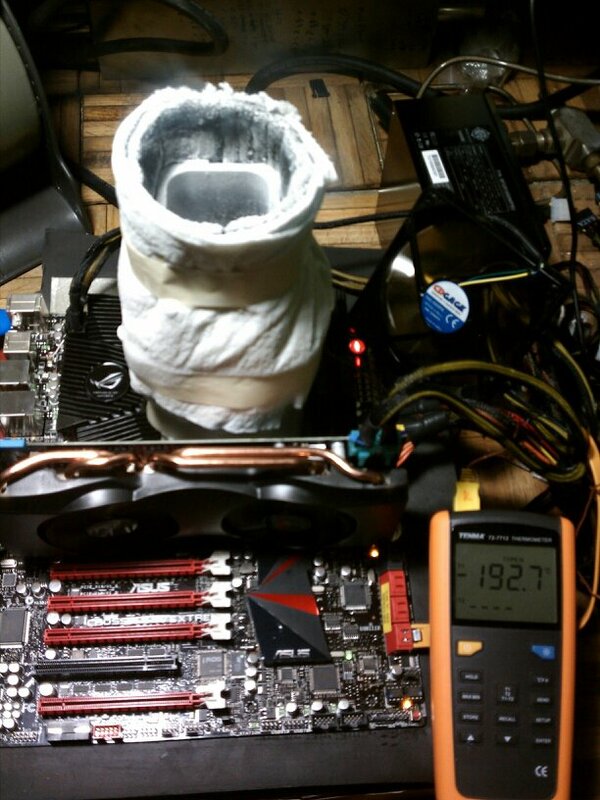 Anyone interested is invited to come watch the extreme cooling, chat with other viewers, and learn more about extreme overclocking. If you aren’t free tonight, try and stop by tomorrow afternoon. I will be benching 2D HWBot.org applications only: SuperPi1M, SuperPi32M, wprime32, wprime1024, and CPU-Z. This will be my second time running this processor under LN2 cooling. Last weekend, I found the limits of the CPU under LN2 for the first time at the Landogs.com LAN Party in St Louis. So this weekend I’ll be working mostly on fine tuning the CPU settings, specifically working voltages at 1.85V and up, and increasing CPU-NB/RAM frequency, and RAM timings. As the sessions progress, this article will be updated to include the results in a format similar to the previous scores listed above! Hope everyone can drop in to check out my session and help me out! UPDATE: These are the scores I achieved this past weekend. They are all improvements over the scores listed above for comparison. 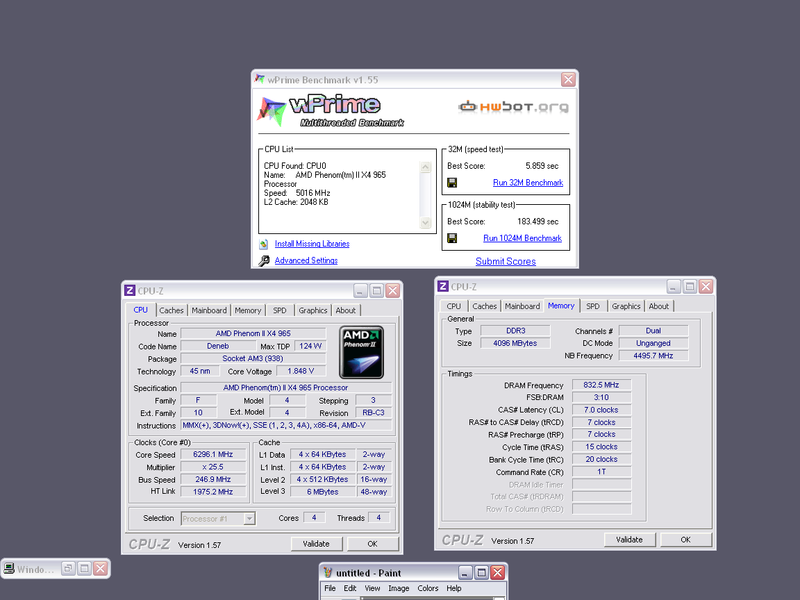 I never got back to working at CPU-Z again, but I improved my scores on both the SuperPi and wPrime benchmarks. My best result? I took 3rd place in wPrime1024M, only 2 people in the world have ran their AMD 965BE through this test faster than my score – 3 minutes 3.499 seconds! Clicking through the links provided will show you my rankings, as well as screenshots of my scores and settings. I recorded the livestream of that session, and you can watch me work at getting that score in the following video. Be advised however, it took me 4 hours so the video is long. The 3 hour and 32 minute mark in the video is where I complete my best run. Previous Article Bobnova Going Sub-Zero Live Tonight! I'll probably be around for this. What board you gonna be on matt? I will be there..... If I don't pass out first. Did not get any sleep last nite watching Mr. novaworks do some Celeron spanking on DICE. Yup, that's the board - those details, as well as the links to my hwbot scores I'm aiming to beat are in the frontpage article - it is more complete than the first post of this forum thread. Not meaning to derail here Matt, if you think it is just delete this I will understand. Cool man, what did it run you? I have a Microsoft lifecam hd5000 and it is really good. 50 bucks and plug and play also. 720p. I want to get a second can also. I paid $35 for it shipped. Couldn't get CPU frequency back to where it was last weekend... Suspect a poor mounting of the LN2 container perhaps. Stopping now, rather than push it when it doesn't want to be pushed... I had a few pools of moisture around the insulation and in the RAM slots anyways, fortunately my insulation was good. Same story last weekend however - we weren't getting anywhere saturday night, so we packed it in. Came back sunday morning, and thats when icebob and I both got some good runs in. :rock: Better luck at noon tomorrow, hope you guys are around. I had a few pools of moisture around the insulation and in the RAM slots anyways, fortunately my insulation was good. Setting up for the noon session now - remounting the pot. I'm getting my tweaks setup also, in the hopes that even if I can't hit the same frequency as previously, I might be able to put better scores up anyways with improved efficiency. Still going. A lot of success today. 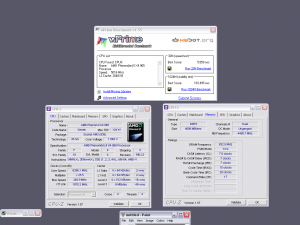 Improved superpi1m, superpi32m and wprime32m. Still working on wprime32m then on to wprime1024. Haven't pushed the frequency any higher yet for cpu-z.